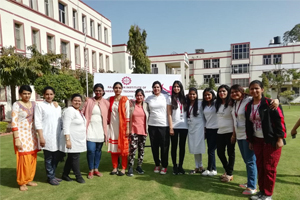 The Rajasthan Institute of Engineering & Technology observed the International Women’s Day which is celebrated every year on 8th March by all women throughout the world. This day brings many things for women – a cause for celebration, a reason to pause and re-evaluate a remembrance, an inspiration and a time to honor, be loved and admired. 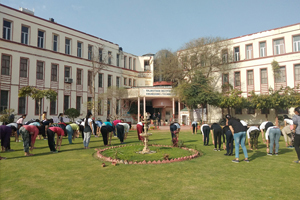 Principal RIET Dr Saroj Hiranwal, along with all the Lady HODs, Ms Shikha Choudhary, HOD MCA, Dr Sonika Sharma HOD, Applied Sciences and Dr Monika Shekhawat, HOD MBA, all lady faculty members and girl students gathered at the mini lawn of the campus for a Self Defense Workshop which was organized to commemorate International Women’s day. The trainer on this occasion was Ms Aditi Lohomi of B Tech CSE II year, of RIET. She is a Gold medalist and a National level Karate champion. 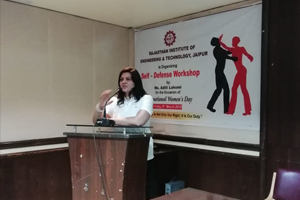 Ms Aditi firstly asked everyone to have a warm-up session and then trained all the lady candidates various techniques and styles of self defence. She also said it doesn’t matter how big or heavy your attacker is because you can beat anyone if you know where the most vulnerable spots are. The main ones are the eyes, nose, throat, chest and knees. You can attack in any way you want, but to be on the safe side, you need to remember that the most effective moves are aimed at these areas. 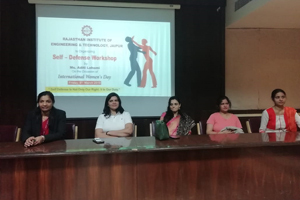 Speaking on the occasion Principal RIET said that Self-defence is primarily about being aware of warning signs, recognizing dangerous situations so you can avoid them and understanding that you are physically as capable as any man to fight back. Stressful situations evoke a fight, flight or freeze response. Self-defence skills prepare you to fight rather than freeze. She also added every woman has the right to fight for her rights whether it is in judicial form or in form of self Defence. After the self Defense session the ladies gathered in the seminar hall for the next session. The chief guest on this occasion was Mrs Dharmita Choudhary, Public relation officer, collectorate, Jaipur. She is Former Anchor, all India radio, Akashwani. Former anchor, ETV Rajasthan. Former, NCC cadet 2007-08 batch. Former NSS cadet 2007-08 batch. Speaking on the occasion she said today, March 8th, is International Women’s Day. What better way to celebrate it than to shine light on the ladies who have contributed to society with their talent, perseverance, and timeless wisdom. This day has emerged as such in the early 1900’s from the movements for women’s rights. Much has been achieved since those days, but much remains to be done in the fight of gender equality. Though a lot of you would agree to the fact that women don’t need a special day to celebrate their greatness, it isn’t so bad after all to have a day showcasing our love and respect for all women around us including ourselves, we are who define our lives to a great extent. 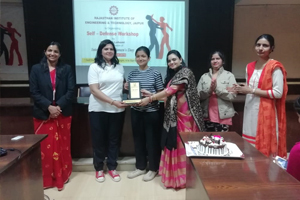 Principal RIET Dr Saroj Hiranwal felicitated Ms Dharmita Choudhary and Ms Aditi Lohomi with a memento and a gift and said that, women are the best managers. They manage home as well as their jobs. They work hard to maintain their family and also pursue their career. She encouraged everyone and said we should all be proud that we are women. At the end of the assembly a cake was cut by all the ladies and everyone enjoyed the delicious cake and a tea session. The day ended with a happy note. 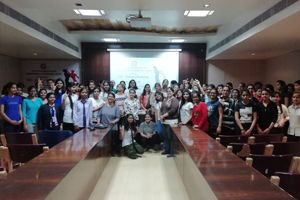 The event coordinator Ms Jyoti Khandelwal, Asst Professor CSE, thanked all the ladies on this occasion.